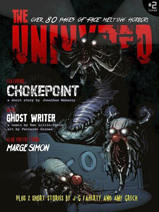 The second issue of The Uninvited magazine is now available. It contains the stories “Chokepoint” by Jonathan Maberry (Rot & Ruin) and “Double Helix” by Amy Grech (Blanket of White). Click here to download the issue.